Sunscreen? check. Sunglasses? check. That's all you have to worry about today. Your villa is made to let fresh ocean air pour in. The giant Wailea Canyon Activity Pool lets the youngsters (and young at heart) have an aquatic adventure! Sunsets overlooking Wailea beach are practically made for Instagram. Kiddos of all ages are taken care of with camps, classes, and rides - there's even a teen lounge. With just a 2 minute drive to Wailea Blue Golf Course, you'll be hitting the links in no time. Fountains, gardens, pools, beaches: it's like they pulled this place out of a postcard! Fancy a little luxury on your family vacay? Enjoy the amenities of a world-class resort hotel, close proximity to to the top-rated beach in Maui, and all the space and comforts of home (and then some!) when you book a villa at Ho’olei. Adjacent to the renowned Grand Wailea hotel, staying at Ho’olei lets you enjoy luxuries you’d expect from an all-inclusive tropical resort while providing a peaceful home-away-from-home to retire to after an adventure-filled day. Begin the day by sipping freshly brewed coffee on your private lanai (aka a patio, for you mainlanders) as you plan the day’s activities. You can whip up your crew’s favorite foods in your state-of-the-art gourmet kitchen, or hop across the street to Grand Wailea to browse seven different onsite restaurants. Couples can relax at the adults-only Hibiscus Pool, while families have a ball at the expansive Wailea Canyon Activity Pool. The onsite waterpark boasts nine different pools with interconnecting lazy rivers and whitewater slides - plus a swim-up bar for the grownups. But as easy as it would be to spend all day pool-hopping (Ho’olei also has its own low-key pool), you can’t miss the oceanic fun to be had at Wailea Beach. 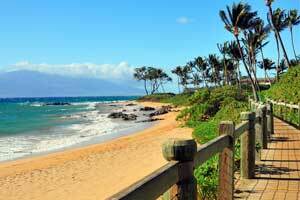 Wailea Beach is a Maui fave, with soft sand and little kid-safe waves perfect for splashing around. Park yourself with a complimentary lounger and umbrella and relax with a good book while the kiddos build the ultimate sandcastle. If you’re feeling active, tag along on a guided kayak tour - especially if you’re traveling during the winter months (aka whale season!). Want to explore beneath the surface? Grand Wailea offers complimentary pool lessons for first-time scuba divers for adventurers twelve and older. When you’re feeling not-so-active, spend an afternoon at the upscale onsite spa. Spa Grande has been called one of the Top 10 Spas in the US by both Condé Nast Traveler and Travel & Leisure Magazines, so get ready for some next-level pampering. One- and three-bedroom villas are beautifully decorated and wonderfully appointed, providing the perfect home-base for your island getaway. Perks like a large furnished patio with barbecue grill, a deep soaking tub in the master bath, and even a one-car garage are over-the-top in the best way possible. Adding to the elevated experience are modern appliances like a Wolf gas range and sub-zero fridge in the fully equipped kitchen. Though you could spend your whole trip at the resort and never get bored, why not explore all Maui has to offer? If your crew likes to snorkel take a short drive down the coast to Maluaka Beach, which is nicknamed “turtle town” (you’ll see why!). Or take a break from the beach to explore the lush tropical landscape that lies inland. Visit the Kula Botanical Gardens to admire and learn about local flora - for a sweet treat stop by Gazebo Restaurant on the way there to try their famous white chocolate macadamia nut pancakes. Planning a grownups-only outing? Try wine-tasting at Ulupalakua Vineyards, known for their exotic dessert wines. - Front desk is open 6:30 AM-9:45 PM daily. Guests that are planning to arrive after hours must check in at Grand Wailea Resort's front desk located at 3850 Wailea Alanui Dr., Wailea, HI 96753. It is open 24 hours. For more details please contact the property using information on the booking confirmation.